Existing-home sales, which are completed transactions that include single-family, townhomes, condominiums and co-ops, were at a seasonally adjusted annual rate of 5.66 million units in May, down 2.2 percent from an upwardly revised surge of 5.79 million units in April. May closings are 19.2 percent above the 4.75 million-unit level in May 2009; April sales were revised to show an 8.0 percent monthly gain. 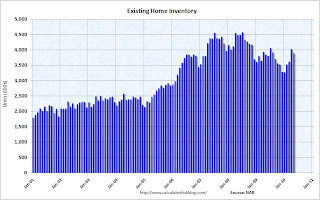 Total housing inventory at the end of May fell 3.4 percent to 3.89 million existing homes available for sale, which represents an 8.3-month supply at the current sales pace, compared with an 8.4-month supply in April. Raw unsold inventory is 1.1 percent above a year ago, but is still 14.9 percent below the record of 4.58 million in July 2008. 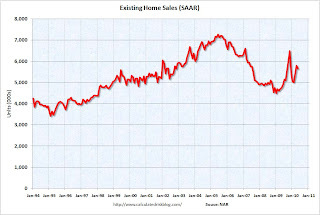 Sales in May 2010 (5.66 million SAAR) were 2.2% lower than last month, and were 19.2% higher than May 2009 (4.75 million SAAR). According to the NAR, inventory decreased to 3.89 million in May from 4.04 million in April. 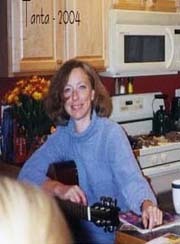 The all time record high was 4.58 million homes for sale in July 2008. Inventory is not seasonally adjusted and there is a clear seasonal pattern with inventory increasing in the spring and into the summer. The increase in April 2010 was partially related to sellers hoping to take advantage of the housing tax credit, and a decline in May was expected (I'll have more on inventory later). The last graph shows the 'months of supply' metric. Months of supply decreased slightly to 8.3 months in May. 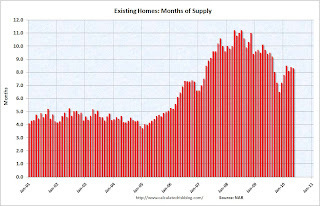 A normal market has under 6 months of supply, so this is high - and probably excludes some substantial shadow inventory. And the months of supply will probably increase sharply this summer as sales fade.